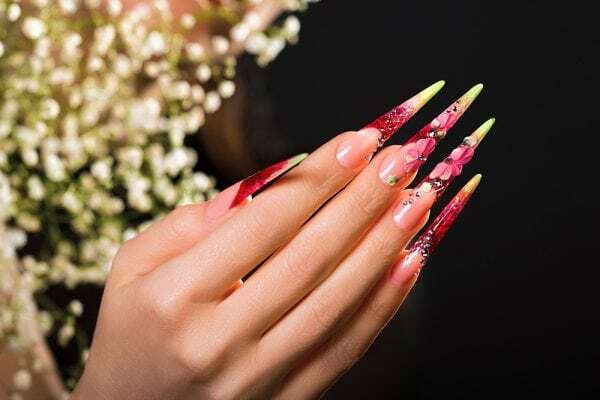 Ever since Kylie Jenner posted a snap of her manicure to Instagram, jelly nails have gotten on everyone’s radar as THE nail trend of the season. 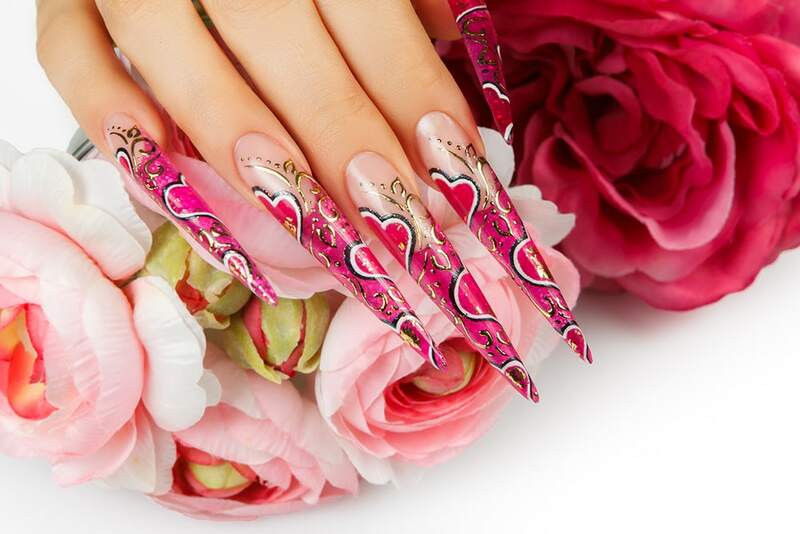 And although jelly nails are nothing new and have been around for quite some time (back then they were known as glass nails), it was only after everyone’s favorite reality star and entrepreneur posted a picture of her long, neon-pink talons that jelly nails became an instant craze all over social media. 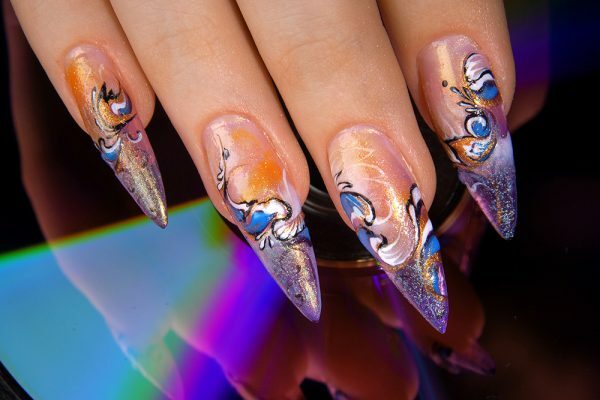 In fact, there have been more than 6000 #jellynails posts and 62,000+ #glassnails hashtags in just a couple of weeks since Jenner was “feeling girly.” Mind-blowing, right? Surely you are intrigued by all the jelly nails that have been flooding your Instagram feed, and you don’t want to feel left behind. 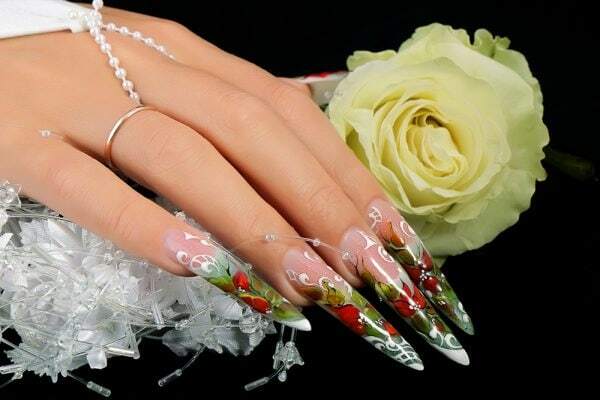 After all, who wouldn’t want to have beautiful nails? Jelly nails have not only taken Instagram by storm; they have also won over our hearts. 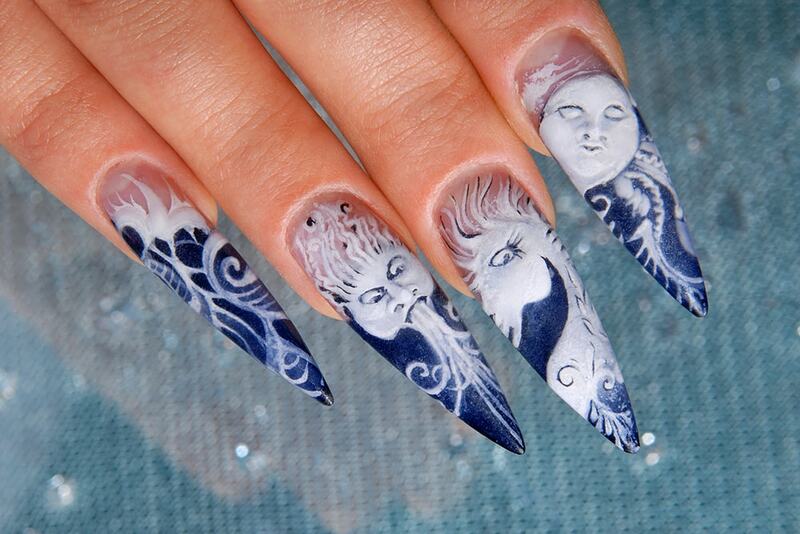 The thing about nail art is that it can be both elaborate and loud or muted and minimal! 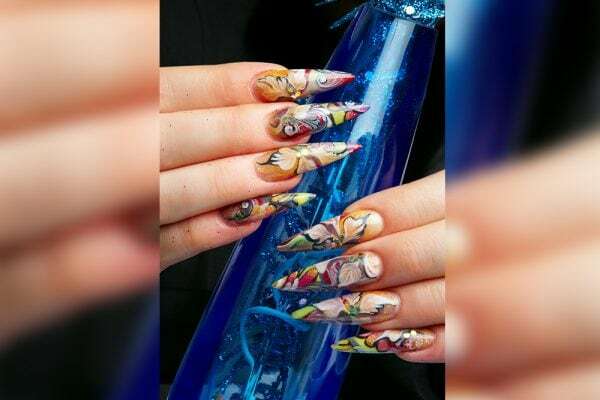 If you want to add some color to your nails, but are sick of the traditional nail art, then you should definitely go for jelly nails! Just like creams, mattes, and opalescent, jelly refers to the texture of the formula once it is applied on your nails. The unique thing about jelly nails is that they offer a splash of sheer color and a lot of shine. 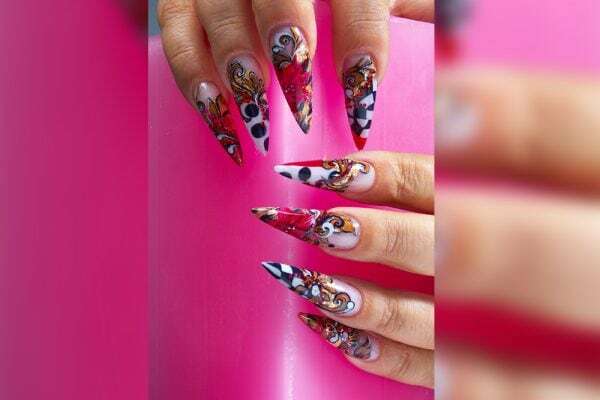 Today, you are in for a treat, as we have here for you some awesome ideas for your next trip to the nail salon (or to your own little corner at home!). Never have FOMO again and go give jelly nails a try! Here are more than 20 colorful and exciting jelly nail art designs! Flowers with beads are perfect for adventurous ladies who want to show their feminine side. 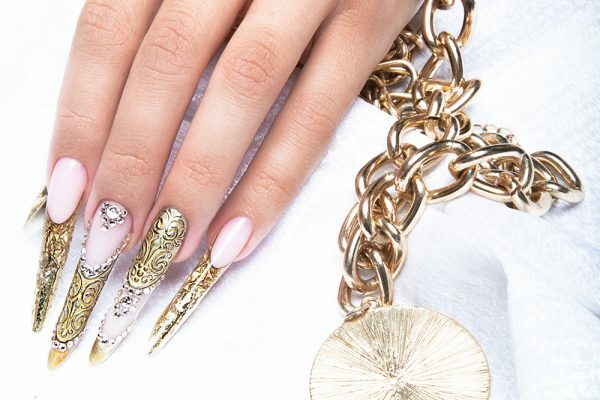 If you are not afraid to experiment, add some beads and embellishments to your nail art design. Because girly girls can be fun and funky, too! 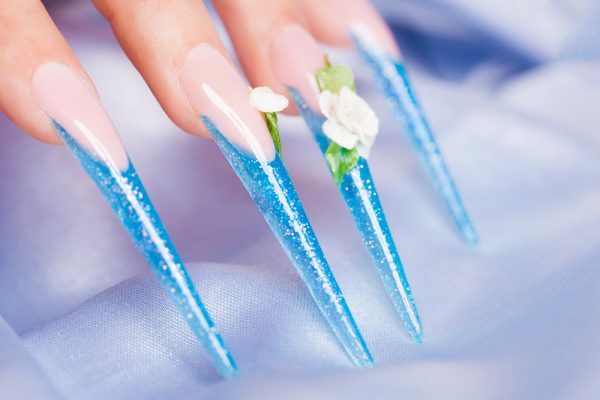 This soothing blue jelly nail design is perfect to show your softer side. 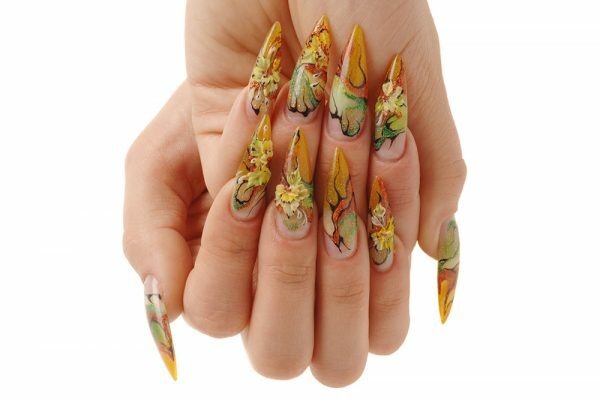 They would look amazing when paired with a dark-colored evening dress as the stark contrast of colors will highlight your nails. You will surely stand out in the crowd but not appear too bold. Anytime you want to let the world know that you would never bend to its whims but rather create your own niche, go for this bold red and gold look. This amazing bright floral design is for girls who want to make a bold statement. The floral design is within the feminine and flirty zone, but the touch of bright colors adds fierceness to your look. This jelly nail design is perfect for the go-getters and dreamers of the world – those who dream big and will do anything to achieve those dreams. 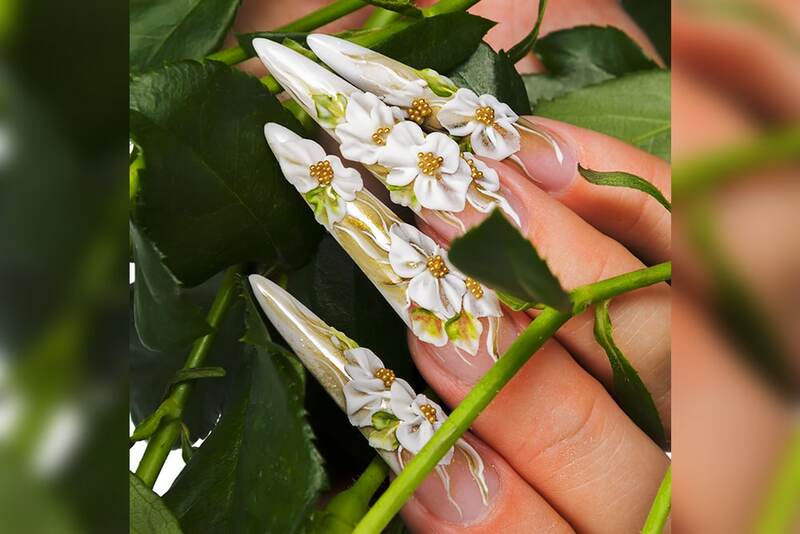 This dainty jelly nail design is very versatile and can easily complement your everyday look. Its soft design and colors make you think of English summers – very cool and refreshing. The fall season is officially here. So why not embrace the season and let your nails show your love for fall. This design is simply stunning and eye-catching. If you love the fall season, but you also want to make a fashion statement, then this design is absolutely perfect for you. With the soft colors gently blending with the bright green, it is hard not to fall in love with this beautiful design. This design is so subtle yet so eye-catching that you could even wear it on your wedding day. What better way to let the world know your style and personality than showing this design off on your big day. 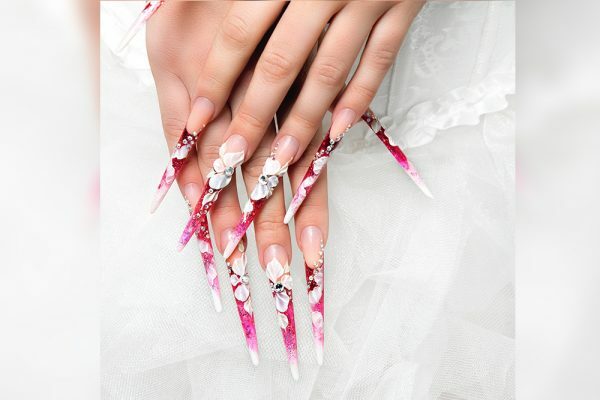 Be that unique bride that you always wanted to be and go get that dream wedding of yours – starting with your nails! Spending the night out with your closest friends? Stand out and shine brightly with gold and glitter on your nails! 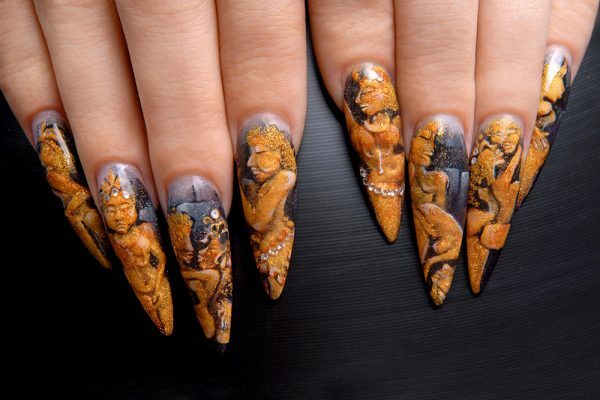 If you are a fan of mythology and fantasy and everything in between, then this nail art design will leave you in awe! This very creative and striking design is also a great conversation piece and will definitely make you the darling of the crowd. This classic white and gold design is quite elaborate, intricate, and luxurious. Its beauty and elegance would surely make you the subject of envy among your girlfriends. 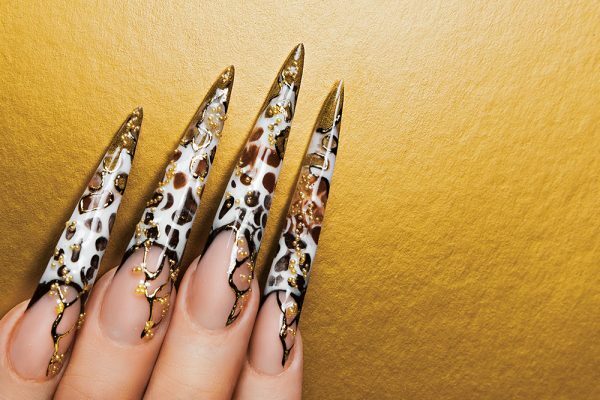 These perfect manicures show off your nails like no other. If you are feeling adventurous but don’t want to step out of your comfort zone, then this design is your solution to the conundrum. Throw caution to the wind and leap out of your comfort zone! This absolutely gorgeous nail art design is not for the “faint of heart.” For those who are willing to take risks and let their emotions take the wheel, this design is impeccable. 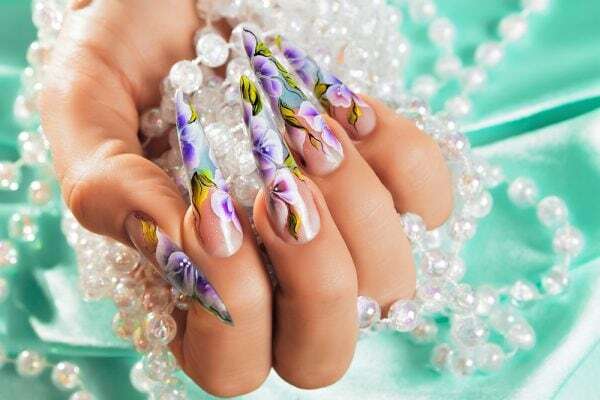 If pink is not your color, but you are passionate and want a design that portrays your passionate nature, then you could go with this purple floral design. Purple is equivalent to royalty and luxury for the queen that you are! 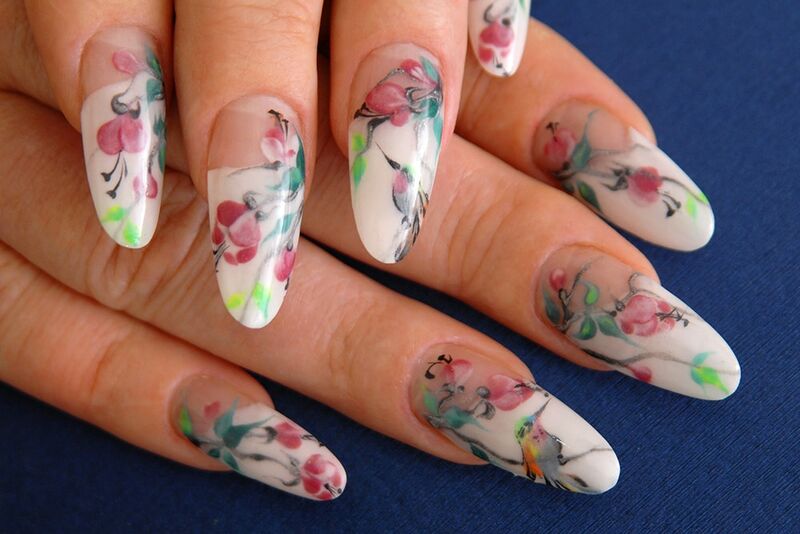 This design again allows you to have plain nails but with a simple yet stunning design on the extensions. The beautiful combination of red and green is definitely a must try. If you are torn between being dainty and fearless, then how about a combination of bright red color, floral design, and embellishments? Perfect, yeah? The beads on the flowers will make you a head-turner! 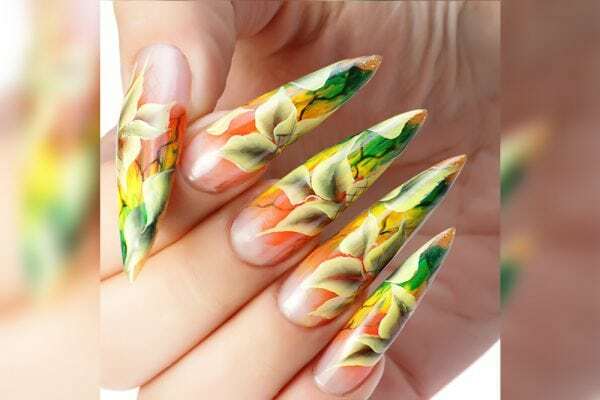 If you have some reservations about jelly nails and don’t want something bright and flashy, then this design is excellent for you. 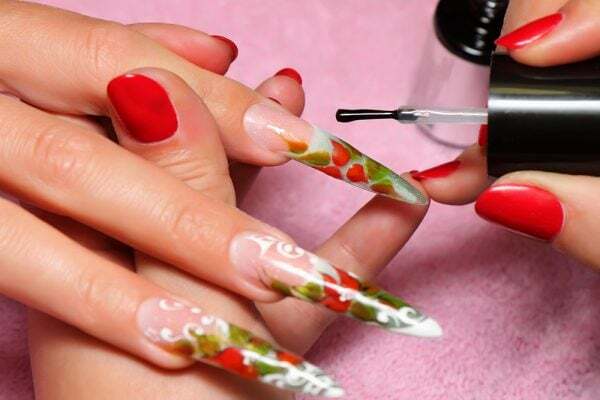 The very soft combination of both color and design will give you lovely and adorable jelly nails. You don’t want something soft, but you also don’t want something bold. You want something in between but unique at the same time. Then how about these statement nails with white flowers and embellishments? The deep-pink base adds a touch of exquisiteness to the design. You don’t want what everyone is wearing; you want a touch of mystery and a whiff of sensuality. You want a design that speaks for itself yet enthralls everyone. 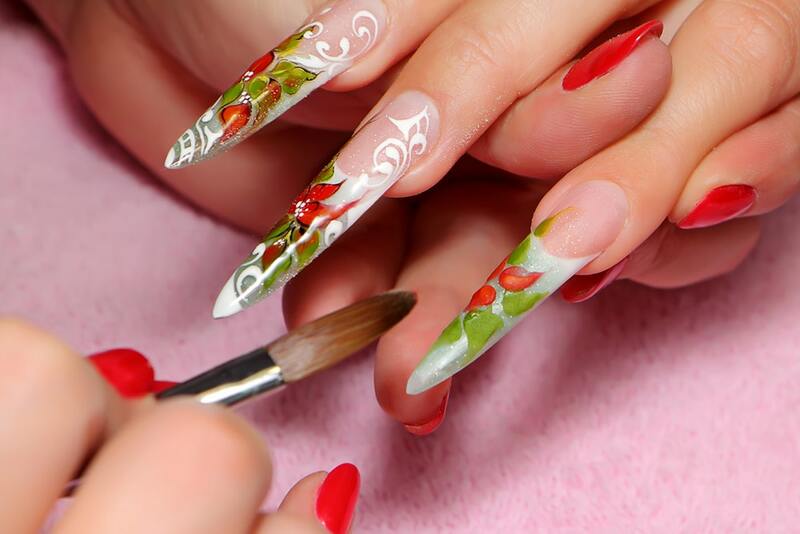 This 3D flowers design will look flawless on you! This elegant golden design is both elaborate and classy. It is the perfect combination of bold and charming. 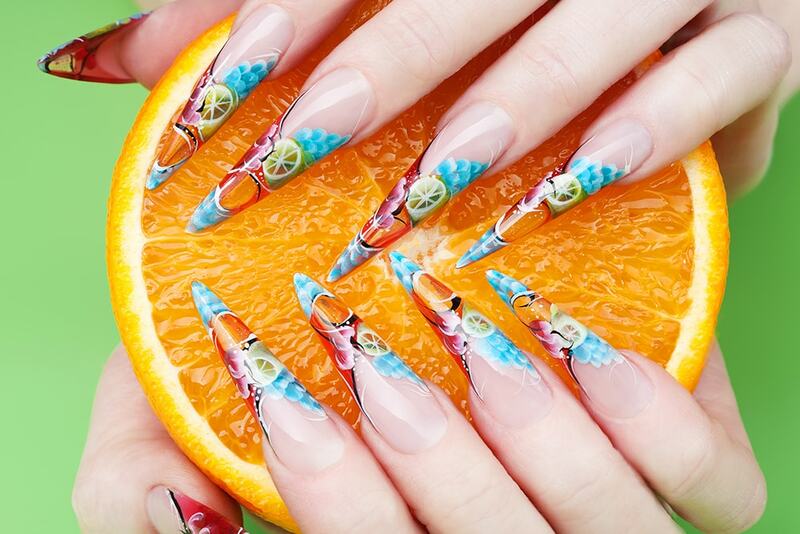 This design screams summer! The beautiful combination of blue and orange colors with a dash of deep pink and green makes it stand out. Super fun and refreshing! One of the hottest fashion trends this season is nature-inspired designs. How about painting your nails blue and showing your love for the beach? These pretty blue nails have a touch of glitter and stones for that glammed-up look. A very beautiful combination of two of the softest shades: pink and white. 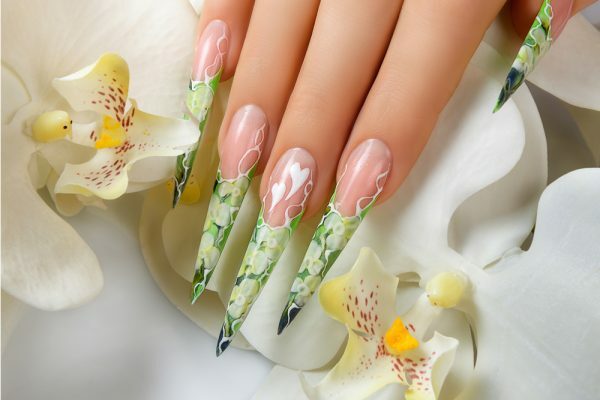 This nail art design is soft, subtle, feminine, and elegant. You can never go wrong with it!